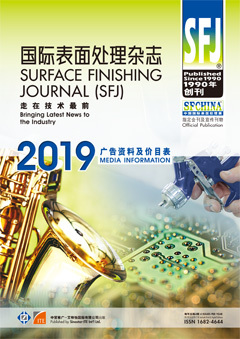 First published in 1990, SFJ is a bilingual (Chinese/English) technical / trade journal offering an integrated print and digital platform to the surface finishing industry. SFJ brings readers market news and trends, technological advancements, new products and services, to expand their knowledge and keep up with latest industry development. SFJ is published 4 times a year in March, June, September and November, with a print circulation of 6,000/issue and a digital distribution of 4,000/issue. As the official publication for the reputable SFCHINA series of exhibition, a special edition of ‘SFJ Directory’ is published and distributed at SFCHINA exhibition. Surface finishing market is forecasted to witness significant growth owing to rapid development of manufacturing industries, increasing infrastructure spending, rising disposable incomes and urbanization, and thriving middle class in the Asia-Pacific region. SFJ provides advertisers with a shortcut to connect with potential customers of the industry. SFJ is the official publication for SFCHINA series of exhibition. A special edition of ‘SFCHINA Directory’ is being published and distributed via this exclusive channel to show visitors. Exhibitors can rely on SFJ to capture attendees' attention and maximize onsite exposure, while non-exhibitors can convey your messages to locate more sales leads and build brand recognition. Our editorial team and contributing writers are industry experts and consultants to plan the content in each issue. Our informative feature articles cover new technologies and innovations, market trends, new product releases, and cost-effective solutions to meet regulatory requirements, delivering a system of networking and communication among industry players. SFJ is the ONLY industry magazine being actively published in Chinese-English bilingual in Asia-Pacific region. Our readers are mostly decision makers from downstream industries. We deliver your company's image in front of influential industry players who source products or services relevant to their needs. We also display your company's expertise in front of your competitors and peers at the same time. Surface Finishing Journal (SFJ) is published by Sinostar-ITE Int’l Ltd., with its registered office at 2101-2, 21/F., Jubilee Centre, 42-46 Gloucester Road, Wanchai, Hong Kong. SFJ is published in four issues a year, in March, June, September and November.